Meredith sat by the log fire last night, sipping a cup of ginger tea* wrapped in woolly jumpers and a blanket. She is developing a cold–no doubt about it! I bought more ginger this morning and there’ll be chicken broth “on tap”. 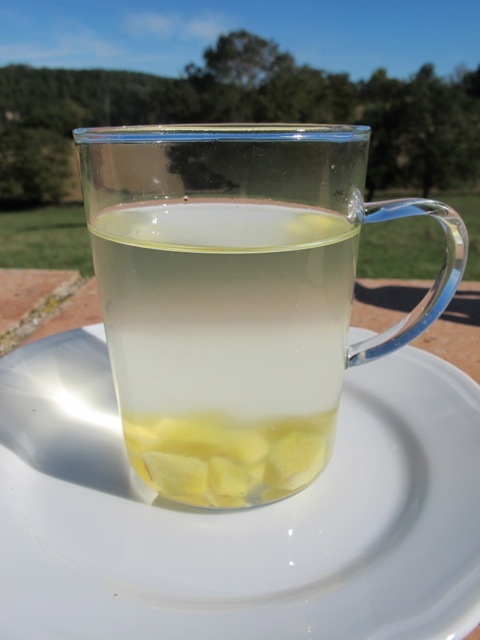 Ginger infused in hot water–just that–is delicious and good for relieving the symptoms of colds. It can also has beneficial effects for people with diabetes. The patient announces she slept better and would like some chicken broth and two eggs scrambled on toast for lunch followed by another infusion of GINGER. nice! For refreshing cold beverage I have done lemon, cucumber and ginger in water and put in the fridge for an available refreshing drink. Love ginger, so will definitely try this. Looking for something to help with blood sugar levels and reduce insulin dosage. How’s the patient? on October 13, 2013 at 2:25 pm | Reply Dianne P.
Feel better, Meredith! Maybe this early cold will stave off the worse ones later this winter. How long should the ginger be seeped to be a tea? half hour? I will give this a try. I have been taking Tumeric in pill form everyday since February. I have not had a cold since that time. An Indian nurse at the hospital where I work recommended Tumeric. In fact a pharmacist at the hospitaI says he takes tumeric when he feels he is developing a cold. Thank you for the info on ginger. Any amount of time–two three minutes and your tea will be hot–as I like it. Thirty minutes and your tea will be cold–but if you don’t mind that it will be more informed. It’s a matter of taste. The tea should be pleasing to you to drink–it is not a medicine but, according to the article, its properties like those in turmeric can have therapeutic results. We drink it in the evening after eating–for pleasure. Do yo think by drinking this on a regular basis this will keep diabetes away. I am so afraid of getting that. Plus trying to loose some weight, could this keep the cravings for sugar away? Losing some weight is important and keeping Sir Sugar under control; he’s a surly fellow who keeps on turning up and will not take no for an answer! Dear Robin,Give Meredith my regards and a hugh, hope she gets better soon! Thanks Rachel, Meredith is feeling better. The older cats–Pippa and Lucian posted themselves all day on the bed, willing her well! Pippa is a ginger too! Ginger seems to be a wonder. Hi Robin, you are so full of valuable wisdom which I shall follow! I’ve always used ginger a lot in cooking i.e to stop cabbage giving me tummy gripes etc. On another subject entirely, if you have heard any whispers down the grape vine, do you have any inkling of who might be the next Poldark, although I don’t envy them having to walk in your footsteps, cos we all love you! No whispers heard at present! Robin I am a firm believer in ginger,it’s so good for you, and it’s pleasent to drink. please wish Meredith a speedy recovery,I know she has a very good nurse to take goos care of her. What a loving and attentive husband you are, Robin. God Bless you and Merideth – hope she is feeling much better and you stay well. Thanks for the valuable info about ginger! If you have one of those 70’s gadgets, the garlic crusher, it is useful to gently crush the ginger and the flavour is released ‘tout suite’! Good tip and you get the benefit of a whiff of garlic too! Lovely. What a good guy. I was just scrolling through your blog here looking for more taste tantalizing delights to cook and came across your information on the ginger root plant infused tea. 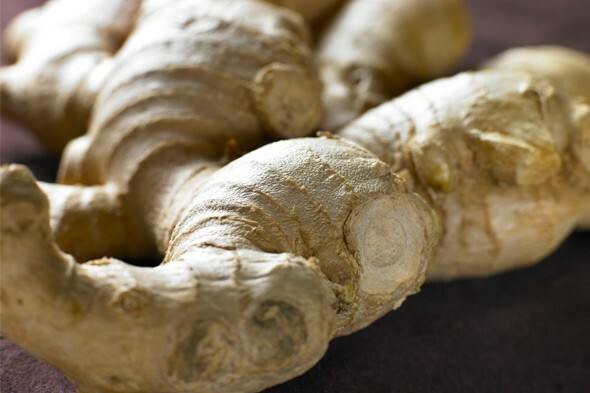 I had absolutely no knowledge about the anti-inflammatory effects from ginger root. Thank you for pointing this out!!!!! Ginger root is going on my shopping list immediately so that I can give it a try and see if it helps any. I am one of the many people out there living and dealing with Fibromyalgia Syndrome and Osteoarthritis and presently waiting test results to find out if I have now developed an autoimmune deficiency. I resisted being medicated for these things since the first year of diagnosis which was June 2000, but recently had no choice but to surrender to prescriptions that I detest taking. I just keep thinking there has to be something more natural out there that could help ease down the constant forever pain. I know your not selling ginger root tea as the end all cure all miracle. I understand that. But if consuming it regularly proves to help even ever so slightly it will be worth the adventure of trying it. Thank you Mr. Ellis for posting about this. Hope it helps–and anyway it tastes good! I have type2 diabetic.uam drinking ginger with warm water.i think its v v good. is ginger with warm water good for me? I drink ginger and hot water–call it ginger tea–every day. It’s delicious. It’s not bad for you! Hello sir. i eat garlic paste with yogurt .is it good for type 2 diabetic ? Good certainly if the garlic is fresh. Not sure you’ll keep all your friends though! !